RAPAPORT... Global Witness is calling for improved transparency in Zimbabwe’s diamond sector, pitching it as a test case for the new president’s economic reforms. “The new government’s handling of the Marange diamond industry will be a clear indication of whether its commitments to economic reform and anti-corruption go beyond lip service,” Sophia Pickles, campaign leader for the organization, said last week. Zimbabwe recently indicated that it will allow certain companies to explore and mine diamonds in the country, and that it would explore the possibility of allowing foreign majority ownership. By doing so, the country needs to make several changes to bring its diamond trade in line with transparency and accountability standards, Global Witness noted. These include publishing all beneficial owners or private investors in diamond companies, as well as detailed information about all diamond-mining revenue and any joint-venture contracts signed with private investors. The country also needs to ensure that any company trading in Marange diamonds adheres to certain due diligence standards so that the integrity of the supply chain is maintained, the civil society group stressed. The security sector should also not hold any ownership positions in diamond companies as it has in the past, Global Witness added. Zimbabwe’s leadership changed in November 2017, when former president Robert Mugabe was ousted from his nearly two-decade rule. During those years, Zimbabwe faced corruption in its diamond industry, Global Witness claimed. In 2008, state security forces killed nearly 200 citizens in an effort to clamp down on informal mining in the Marange fields, resulting in the country’s removal from the Kimberley Process. Although the ban was lifted in 2011, the US continues to boycott diamonds from the deposit. Global Witness sees an opportunity for new president, Emmerson Mnangagwa, to use the diamond industry as a catalyst to end the country’s international isolation and attract foreign investors. 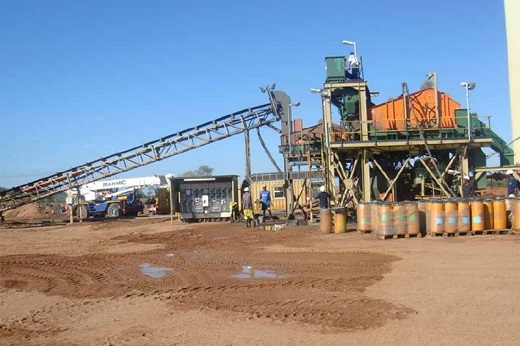 With potential new investors coming to Marange, it is critical the government act now to improve governance in the diamond sector if the mistakes of the past are not to be repeated, the organization said. “Opening up the diamond industry to public scrutiny will make it much harder for bad actors to permeate and devastate the sector and may give reputable investors and the international community confidence in the commitment of the new government to genuine reform,” it stressed. Image: Marange processing plant, Zimbabwe.